So at 3 o'clock last night I decided that this was the last high altitude trip I was going to do. Having gone to bed at 7.30 I had been awake since 2am. I was cold and uncomfortable and was clearly not going back to sleep. I just couldn't understand why I was there - why am I paying money to be cold and uncomfortable? Writing this and the whole thing has flipped again. The cold cloud free night meant a beautiful day - clear blue skies and, once the sun cleared the mountain, a warm day. The walk up the valley along the glacier was the best of the trip so far and, until 3 o'clock tomorrow morning it all seems worth it. It wasn't a long walk, perhaps 4 hours, but it was perfectly paced and very relaxed. Yesterday's anxiety about rock falls and beating the thaw had disappeared and there was plenty of time to chat and take in the views. I had a particularly interesting talk with Pem. He told me that the weather had actually been worse when they did the trip last year and when they got to altitude it was snowing. 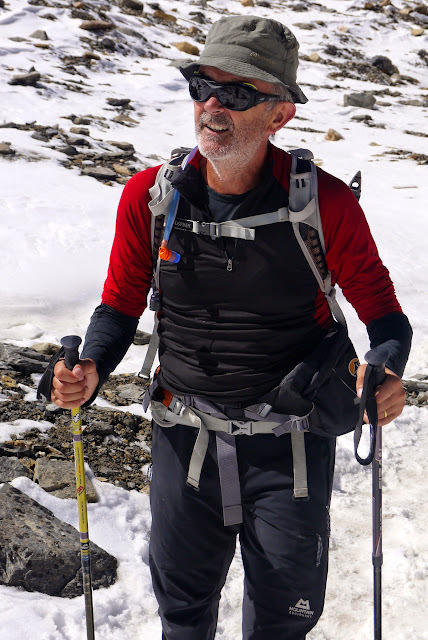 I asked him whether I would need to wear heavy plastic boots to go over the French Col, the big pass we do the day after tomorrow, and he said if conditions stay as they are he didn't think we would. My boots are the lightest Miendl's money can buy so to continue in these rather than the clod hopping plastic boots would a great relief. 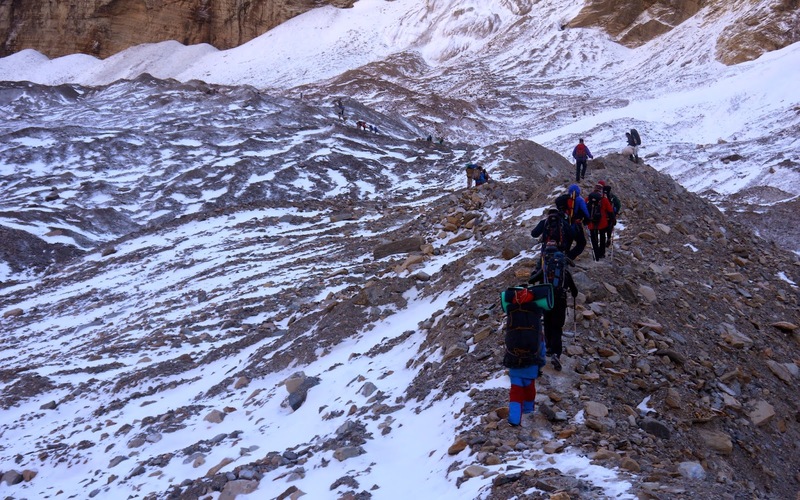 He also compared trips and admitted that from his point of view Dhaulagiri is a hard trip to organise. It's not popular with the porters who find the number of days at altitude difficult; they prefer the Annapurna Circuit. The only way to recruit them is to pay them more, 1000 Rupees at day plus food at altitude compared to the 600 Pem gets. It was cold when we started the walk and it looked cold. There was a blue tinge to the landscape which dwarfed the tiny figures of porters already scattered across it. High above us hung a glacier fed by snow from the western face of Dhaulagiri. Falling slabs of ice from this glacier had probably resulted in the bangs we had all heard early in the morning. As soon as the sun came out everything changed - in an instance it went from freezing to warm and the down jackets everyone had been wearing for protection against the cold had to be removed. 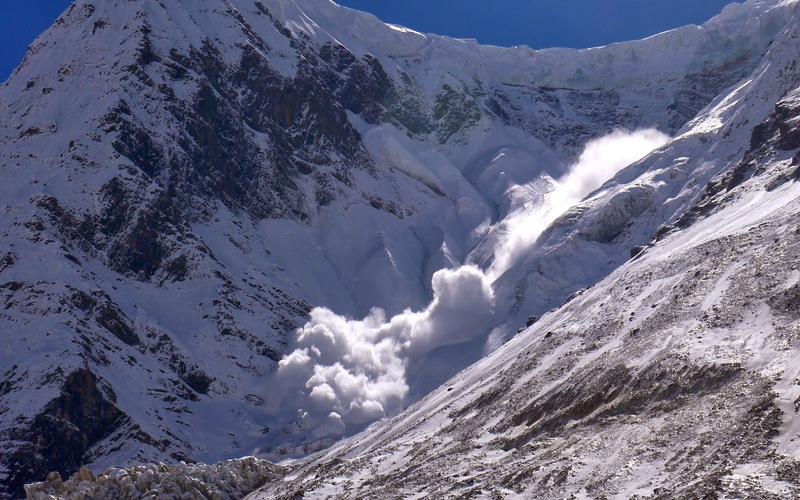 The sun also set off a round of avalanches, one of which was particularly spectacular. The further along the glacier you walk the more "glacier" and less slag- heap - like it becomes. Great slabs of ice start to appear above the rubble and you even have to watch out for the occasional crevice. We arrived at Dhaulagiri Base Camp (4740 metres) just after 12. Although we have passed lots of other base camps along the route, including the Japanese and American, it's from Dhaulagiri Base Camp where ascents are now typically made. 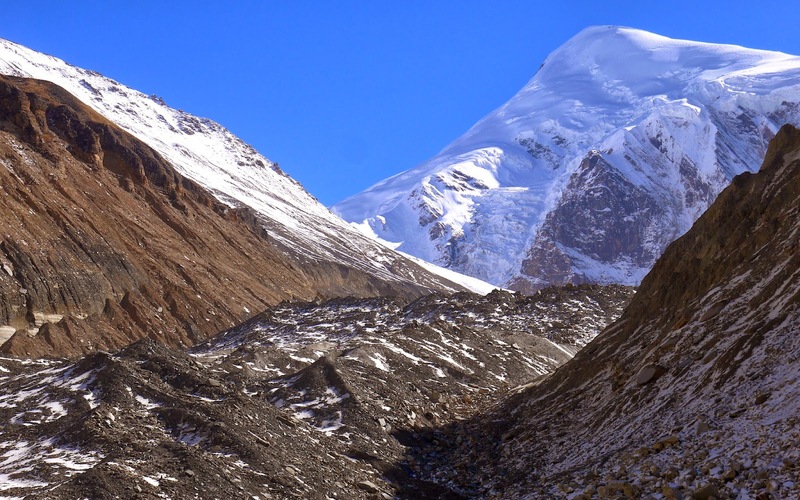 It's located at the end of the valley we have in effect been following since the first day of trekking and has Dhaulagiri on one side and Tukuche peak on the other. The location is stunning. I did the trip to Kanchenjunga Base Camp four years ago attracted by the claim that it was the most beautiful campsite in the world, and although it was definitely a cracker this one competes. 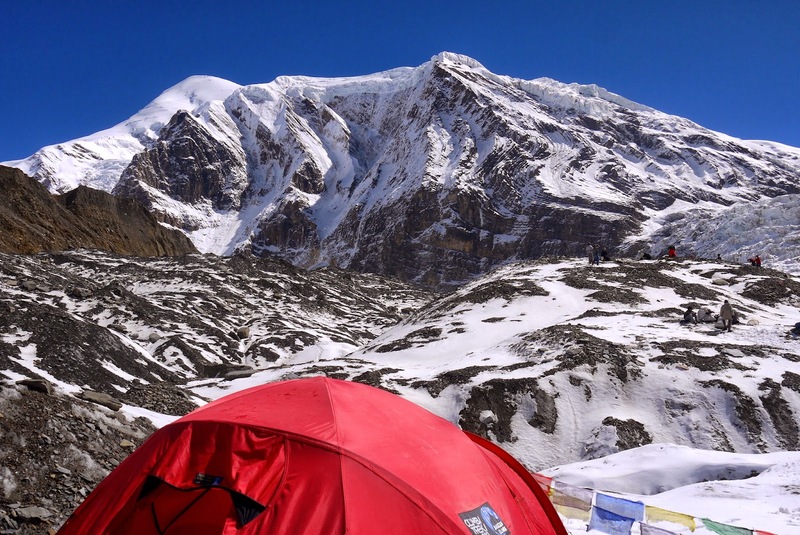 Both camps are right underneath huge mountains - up close and personal - but with Dhaulagiri Base Camp you see the next stage of the journey and it's definitely doesn't involve turning around and going home.